I look forward to returning to the Rubenianum in Antwerp to deliver a keynote at the upcoming international conference ‘Many Antwerp Hands. Collaborations in Netherlandish Art, 1400-1750′, which will take place on 5 and 6 November 2018. I have always been intrigued by the high frequency of artistic collaborations in the city of Antwerp during the early modern period. These went beyond the division of labor between a master painter and his pupils, and included joint ventures between master painters and collaborations between artistic disciplines. Famous examples are Rubens and Jan Brueghel, and Quinten Metsijs and Joachim Patinir, but there are many more. In my talk, I will explore whether these collaborations were a unique selling point of the Antwerp art scene. 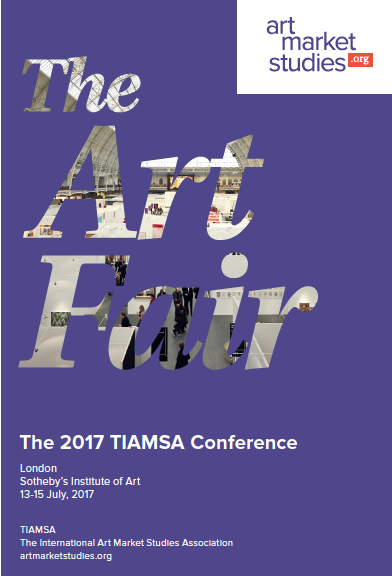 The first conference organized by The International Art Market Studies Association (TIAMSA) will take place in London from 13 to 16 July 2017. A cross-discipline and international gathering of scholars and practitioners will be looking at one of the most remarkable developments in the art market in the past two decades: the proliferation of art fairs. Speakers will examine the history of these institutions and their proliferation worldwide, and why they have become such important events in the art world. My own contribution will focus on the historical roots of art fairs in Europe. The birth of the modern art fair is usually associated with the Cologne Fair of 1967, but predecessors can already be found in Antwerp during the fifteenth and sixteenth centuries. A sales room – referred to as Our Lady’s pand – built purposely for the marketing of art was already operational in 1460. During the bi-annual trade fairs, this was an important meeting place for artists, dealers and an increasingly international clientele. This fair greatly stimulated the art trade, and afforded Antwerp to emerge as a net exporter for on spec produced paintings, prints and other goods of fancy. Furthermore, around 1540, the first permanent gallery called the schilderspand was set up in the halls above the Antwerp exchange with new fewer than one hundred shops displaying mostly paintings. We know from archival materials that dealers kept a large stock, and that new subjects and styles were on display, allowing potential buyers to compare and evaluate before making their choice. In addition, the face-to-face contacts between artists and dealers, and among artists themselves, created significant opportunities for artistic exchanges and knowledge transfers. This meant that there was room for experimentation which in turn allowed for the surprise of novelty. And once a particular new style or new subject caught on among the art lovers and merchants visiting the galleries at the pand, it could be commercialized and reproduced in large numbers. Examples of these are landscapes, nudes and other mythological scenes, and genre paintings. In my talk I will argue that the Antwerp panden were not just predecessors of the contemporary art fairs, but that they constituted a significant phase in the development of the present-day art market system. The research project on the cultural industries in India took me to the east of the country in November 2016. The case study of Mithila (or Madhubani) painting allows us to get a better sense of how globalization is impacting a traditional art form. Mithila art dates back to at least the fourteenth century and consists in its original form of wall or floor paintings made for certain rites of passage (births, marriages, etc) in remote villages in the state of Bihar. For centuries, it was an art form exclusively practiced by women. Interestingly, it was only in the late 1960s that these colorful compositions laden with Hindu symbolism were transferred to paper, and offered for sale. These days, Mithila art enjoys national and increasingly international renown, and these images – now on various supports including saris, ceramics and notebooks – can readily be bought in the major cities and online (including via Amazon). The art form has been subject to commercialization, and I have been wondering what drives this market and to what extent the artists are actually benefiting from this surge in popularity. So I set out with former Erasmus student Bhagyalaksmhi Daga to the Madhubani district to interview as many stakeholders as possible. As a native Hindi speaker, Bhagyalaksmhi was instrumental in establishing a connection with these painters. We managed to interview 16 artists which yielded a wealth of information. The online course Payal Arora and I designed on emerging art markets in the digital age has gone live! It is part of a three-part MOOC on the business and practice of the contemporary art world. The course focuses on the internet and emerging art markets, and how they serve as game changers in a rapidly changing art world. We stimulate participants to explore seminal themes such as art quality, commercialization, digitization and globalization and how this relates to their own experiences, as well as contemporary events and scholarship. The course aims to probe and understand the exciting complexities and development of the global art market. I was approached by Canvas, the Flemish national TV station, to contribute to the making of a documentary on the British economist and intellectual John Maynard Keynes (1883-1946). As the father of modern macroeconomics, he is widely considered as one of the seminal thinkers of the twentieth century. Keynes almost singlehandedly shifted the attention from supply side economics to the necessity to stimulate demand in times of crisis, and the inevitable role of governments in this respect. His impact on economic policy is felt to this day across the globe since Keynes’ thinking enjoyed a resurgence after the crisis of 2008. The aim of the documentary is to rediscover the man behind ‘The General Theory of Employment, Interest and Money’, published in 1936. I conducted a series of interviews in Cambridge, London, near Brighton and in Belgium. I spoke to economists, relatives of JMK and authors who have written about his private life. I also examined his father’s diaries at the University Library in Cambridge. All of this made me realize that Keynes was so much more than an economist, but rather an intellectual with a wide range of interests and a great patron of the arts. The 50-minute documentary will be broadcast on Belgian TV late October or November. Together with Abdul Shaban (Tata Institute of Social Sciences in Mumbai, India), I received a grant from NWO and the India Council for Social Sciences Research for a project on the development of the creative industries in India. The grant will facilitate research trips in 2016 and 2017 for the both of us and the funding of a team to assist in onsite data gathering in India. The creative industries have become of enormous economic and social significance in recent years. A nurtured and thriving creative economy can infuse human centered development, fuel job creation, innovation and trade while at the same time promoting social inclusion, cultural diversity and environmental sustainability. In India, which has both advanced (like software design) and traditional sectors of the creative industries (crafts), neither through research nor policy much headway has been made to promote it as an integrated sector. Millions of traditional creative workers in India are unemployed or form major shares of the neo-poor. A coherent and informed policy can specifically provide new opportunities to these hitherto lower-end workers in the creative economy. In the this context, we will attempt to examine the size, potential and clusters of the creative industries in India, and compare it to countries such as the UK, The Netherlands, China, etc. We will suggest policy measures to stimulate the creative economy in India. Also, case studies focusing on Madhubani Painting, Lucknow Chickenkari, Leather Industry in Dharavi and Performing Arts in Mumbai will be carried out to understand the specific context, potential and issues that some of the creative industries face and which will help in understanding the overall creative ecology in the country. The results of this research project will be published in a concluding volume. To commemorate the 250th anniversary of the auction house, Christie’s is organizing a two-day conference in London (King Street location) on 15-16 July 2016. The conference will feature expert panels and twelve sessions on a variety of art market topics for which a Call for Papers has recently been published. My own session will focus on Christie’s and the birth of the European art market around 1800. In in a joint paper, Neil De Marchi and myself will explore how James Christie was able to dominate the elite market early on. For more information on the conference and the call for papers, please click here. I got profiled in the Belgian newspaper De Standaard as part of a series on five ‘innovative Belgian scholars’. The Belgian Academy of Science had been asked to make a short list of promising scholars, and I am honored that I somehow made the cut. It presented a rare occasion to showcase my research and my university to a broad audience! The PDF of the article (in Dutch) can be found here. I am delighted to spend the Summer as a visiting scholar at the renowned Getty Research Institute in Los Angeles. Together with my good friend and colleague Dr. Christian Huemer, we have started to explore the possibility of co-authoring a synthesis on the history of the art market. A volume like this does not exist to my knowledge, and would be useful for students and readers generally interested in the art market. Christian is the head of the Project for the Study of Collecting and Provenance at the Getty, and very knowledgeable about the nineteenth and twentieth century. Since I have done work on the early modern period as well as the global art market of the twenty first century (notably India), we hope that our complementary expertise will result in a worthwhile book on the fascinating development of the art market since the Renaissance! The volume ‘Cosmopolitan canvases. The globalization of markets for contemporary art’ edited by Olav Velthuis and Stefano Baia Curioini has hit the shelves! An international gathering of economists, sociologists and anthropologists contributed to this exciting volume, giving us a timely assessment of the most poignant developments in the art market today. I wrote a chapter on the India Art Fair, held annually in Delhi, and which is the most important contemporary art event of this emerging art market. For more information or to order the book from Oxford University Press, click on this link.